Reproductive health care provider, Planned Parenthood has taken to social media to assert women’s rights to safe and adequate sexual healthcare to US Secretary of State John Kerry this International Women’s Day. Using the hashtag #WorldWeWant, the organisation is calling on Kerry to work towards a world where access to good reproductive and sexual healthcare is not dependent on your postcode, gender, sexual identity, ethnicity, or skin colour. Planned Parenthood further urges Kerry to not allow politics to ‘come between a woman and her health care provider’, provide trusted information on sexual health, ensure all girls are just as likely to stay in school as their male counterparts, and more. The campaign was enacted to reflect on the progress of women’s rights 20 years on from the United Nation’s Cairo Conference on Population and Development. The 1994 conference began to see women’s health and rights as a means to achieve the UN’s goals regarding poverty and sustainable population growth. ‘What we learnt in Cairo is even more true today,’ International Women’s Health Coalition President Emerita, Adrienne Germaine said in a Planned Parenthood video. The fight for Planned Parenthood becomes harder as conservative American states enshrine pro-life sentiments in legislation, with two Texas abortion clinics closing down last week as a result of the state’s laws. 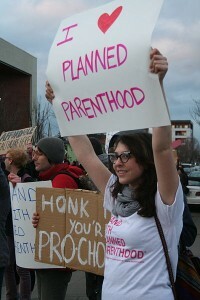 This entry was posted in News and tagged #WorldWeWant, international women's day, News, Planned Parenthood. Bookmark the permalink.